Mt. 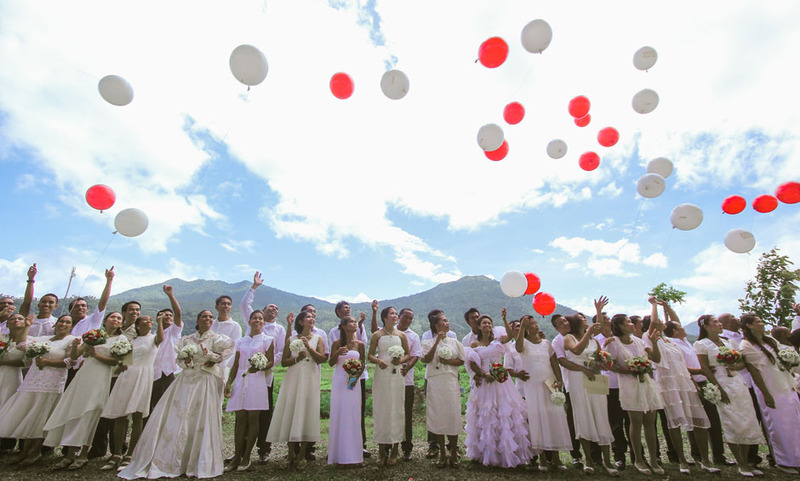 Kalisungan served as a beautiful backdrop for the balloon release done right after the wedding ceremony. On February 23, Bantay Bata 163 Laguna hosted the first Kasalang Bayan in BayaniJuan sa Southville 7 in Calauan, Laguna. The mass wedding was held for 38 couples, with ages ranging from 18 to 53 , who have been living together for years. These couples were relocated from BayaniJuan three years ago. All of them have children, some even have grandchildren already. They could not afford to legalize their relationships due to financial difficulties. 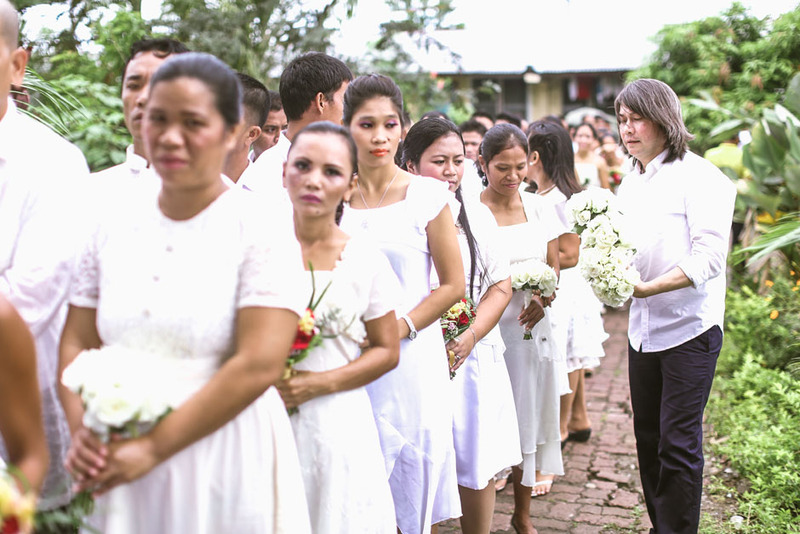 Among them is 53-year old Nemia Joven, the oldest among the 38 brides, has been living with her common law husband Bernardo Osillada for 33 years now. She related that they came from Sorsogon, Bicol and met during one of the benefit dances in their barrio when she was about 20-year old. After dating for a few months, they eloped and lived together in a small nipa hut in Bicol. 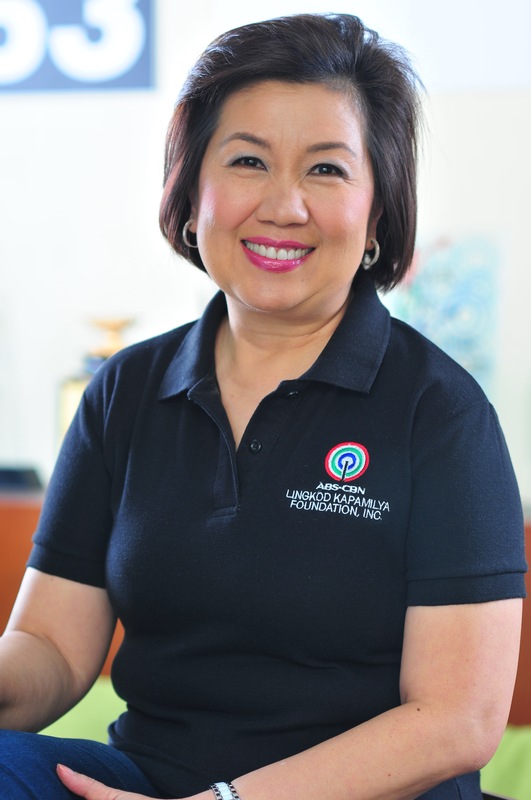 After their first six children were born, her husband decided to work in Manila and left her and their children in Bicol. Struggling to find a job in Manila, her husband failed to send money to Bicol for months. It was then that Aling Nemie decided to sell their small house and follow her husband. She and her six young children moved to her husband’s shanty in Pasig. They were reunited then as a family and Nemia bore five more children, making a total of 11 children. Aling Nemia recalled how difficult life was in Floodway Pasig. They could barely make both ends meet. To help the family, their older children worked as house helpers. Even with some of the children working, day to day living was still a struggle. In September 2009, their house and the little that they owned were swept away by typhoon Ondoy. They were one of the evacuees in ULTRA stadium. On the same year, their family was relocated in BayaniJuan . Slowly, they were able to rebuild their lives. Aling Nemia said that she and Mang Bernardo longed to get married – that’s the only thing lacking in their relationship. She said they wanted to formalize their relationship, solidify their union and show their children the importance of married life. She stressed that marriage is a foundation of a lasting and enduring relationship. When information about Kasalang Bayan was disseminated to the community, more than 50 couples applied. Only 38 though was able to complete the requirements. The 38 couples personally submitted their CENOMAR (Certificate of No Marriage), Birth Certificates and other requirements of the local civil registrar’s office. BB163 Laguna organized the required seminars, tapped sponsors for their wedding and made sure that their ceremony will be memorable. 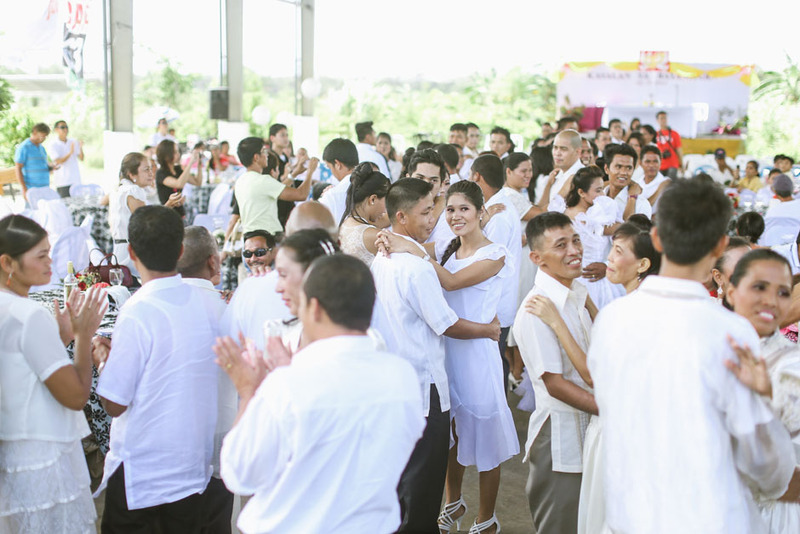 The groom, Bernardo Osillada could not contain his joy as he dances with his bride, Nemia Joven – his partner of 33 years. Wedding planners/ organizers, suppliers were hands on in facilitating a smooth and successful event, from processional, wedding rites to recessional; to reception and reception rites. The event was effectively carried out, giving a grand and solemn wedding to the newlyweds. Mr. Marex Gaba & Ms. Lisa Alviedo from Philippine Association of Wedding Planners showed how the event should be done. Wedding rings were donated by Matus Jewellery , Josiah’s Catering provided food, beverage, reception tables and chairs ; Nybie Ng for hair and make up of the brides; centerpiece cakes were donated by Emil Uy of Sugar Box, Maite Gregorio of Cake Concepts and Bullet of Dexter’s Cake; bouquets for the brides by Teddy Manuel of flowers & Events, Joyce Aguila of Floral Creations, Ramon Pastor of San Ramoune; wine from Goyena’s wine; Mayor Felisa and George Berris for cakes and lechon manok; balloons from Botak and Bubbles; and photos by Dino Lara Photography. 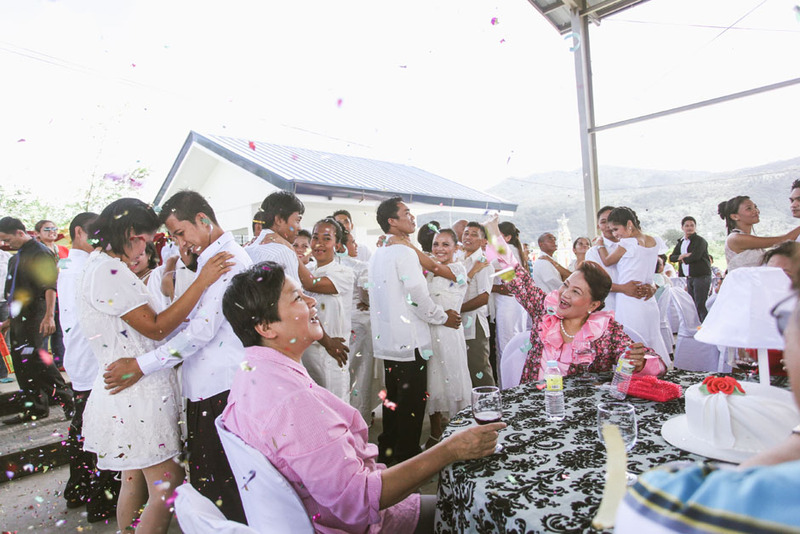 The ever supportive Calauan Mayor Felisa Berris was there to greet the newly weds. She talked about the importance of marriage, being a union of man and woman, who make a permanent and exclusive commitment to each other. Further, she cited the importance of communication, that couple should talk with each other regularly and share their difficulties and desires, respect their opinions and problems. Second was commitment. Mayor Berris demonstrated this as spending quality time with loved ones, school events, anniversaries, meals and special occasions. Third was Christ, putting Him as the center of the couples’ relationship, that they should devote for a joint spiritual life, as the family that prays together stays together. Likewise, Mayor Berris also pointed to reasons why relationships do not work. irresponsibility of both husband and wife in not doing their part as father, mother and as parents. Further, she cited that marriage does not only take love to sustain a marriage. It needs love, trust, respect, common interests and fidelity. From the start to end of ceremony, the couples’ were shown with glow and excitement. Clearly, the exchange of vows was not only a commitment to themselves but as commitment to their families. Their first dance as married couples. Cheers to the newlyweds: Ms. Girlie Aragon, Program Director of Bayanijuan and Deputy Program Director of Bantay Bata 163 (seated, right) and Mayor Berris joins the celebration. The Philippine Association of Wedding Planners took care of the nitty gritty to make the event a success. Here, one of the members is distributing a bouquet of flowers to the brides.